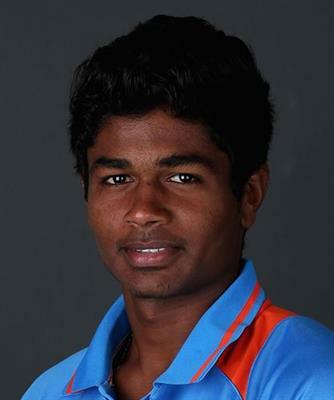 Sanju V Samson Indian cricketer profile and biography is given here. 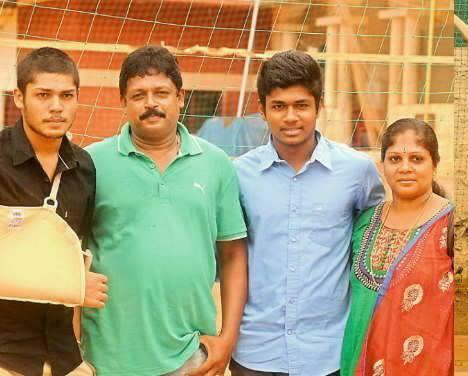 Know more about Sanju V Samson's parents and family details. Born as Sanju Viswanath Samson, this young cricketer at the age of 20 entered the Indian cricket senior team. Being a talented cricketer, Sanju has shown his batting skill in national matches, IPL and domestic cricket. Sanju V Samson is the new sensation in Indian cricket who has made the state proud to be the fourth player to enter the National Cricket team. This wicket – keeper batsman proved his skill playing for the junior national team, IPL and domestic cricket. Scroll down to know about Sanju and his cricket career. Sanju was born on 11th November 1994 at Thiruvananthapuram to Samson Viswanath and Lijy. Samson being a former football player had played for Delhi in the 1994 Santosh Trophy. Samson who worked as a constable in Delhi Police, took voluntary retirement and invested a part of life in building up the cricket career of Sanju. After attending the Rosary Senior Secondary School Delhi till 8th standard, Sanju had to join St. Joseph's Higher Secondary School, Thiruvananthapuram, where he completed his high school education. Sanju who had show talent in cricket played the game along with his elder brother Sally Samson. Being a second year graduation student, Sally plays for the under-25 state cricket team. The encouragement given by his father was much supportive for young Sanju to make a career, every one dreams to live. Having a passion over cricket, Sanju Samson started playing cricket at a very young age. His impressive technical perfection gave him the chance to be a member of the under 13 cricket team of Kerala. He showed the real spirit of his talent after captaining the side and scored a century in the very first match. Sanju went on hitting 4 centuries in 5 matches in the South Zone Under-13 tournament. In the KCA inter state tournament, he scored 973 runs giving signs to perform better in the future. He captained the Under 16 and Under 19 Kerala State Cricket Teams. While playing for the Kerala under 16 team, Sanju scored a brilliant 200 not out off just 138 balls against Goa. His talent was sharpened at the Medical college ground guided by Biju George, the coach of Sports council regional cricket coaching centre. Biju gave the tips and special practice sections for young Sanju who was later transformed to a matured cricketer. Sanju become a member of the Kerala team which played the Ranji Trophy when he was 15 years of age. His consistency in the game and the ability to time the ball in Kerala's U-19 team and Cooch Behar Trophy (domestic U-19 championship) elevated him to the Indian under 19 team which played the Asia Cup. During his Ranji Trophy career during 2013 -14, Sanju cracked his career best of 211 runs. He also became the Kerala's highest scorer of Ranji Trophy during the season making 530 runs of six matches. Even though Sanju admitted as a member of Kolkata Knight Riders, but it was Rajasthan Royals which gained the maximum benefit of in taking a young man was waiting to stun the cricket loving fans, the power of his batting skill. He made his IPL debut against Kings XI Punjab and scored 27 runs and also a win for his team. His 63 runs off 41 balls laid the foundation for the Rajasthan Royals' victory and gained his the Man-of-the-match award too. Sanju continued his batting skill performing better in the IPL seasons. He scored 206 in 2013 and 339 runs from 13 matches in 2014 ILP matches. In the 2013 Champions League Twenty20, Sanju scored 192 runs in 6 matches which included 60 runs out of 33 balls in the Final match against Mumbai Indians. Sanju who was part of the India Under-19 team at the World Cup finished as India A's highest run-scorer in the recently-concluded quadrangular one-day series held in Australia. He scored 244 runs from seven innings at an average of 81.33 with two fifties. Sanju made 81 runs against Australia A, unbeaten scores of 55 and 49. His consistent performance gave him the ticket to the Indian senior team. Sanju Samson became the fourth malayali to become a part of the Indian team after Tinu Yohanan, Abey Kuruvilla and S. Sreesanth. A long career is waiting for prolific young wicketkeeper-batsman Sanju Samson who is looking forward to play for the Indian world cup team in 2015.